I think navigating life is a little harder for women than men. I base this on conversations with friends and acquaintances, not scientific data. Like me, most women I know feel a constant pull/tug of war. We long to help in providing for our families, and yet we have an innate desire to create-whether it be pro-create or create beauty in our homes, through meals, hobbies etc… We are also drawn to relationships. We long to have girlfriends with similar interests, struggles, family situations. We are bombarded with mixed messages. I have often told my husband if he could hear all the conversations going on in my mind he’d know why I’m so frustrated or hard on myself. It’s the voices of dreams gone by, the task I didn’t complete, the blog post from the mom that cooks only organic meals, the weight loss report of the last friend to start Advocare or Plexus. It’s the note from the school about the end of year activities. It’s the last page of the last book I started (which may have been 6 months ago!). Everything that comes into my line of vision seems to take on a voice in my head. Some days it immobilizes me. Some days it spurs me on to accomplish great things. Some days it drives me to my bed in a heap of hurt feelings and disappointments. Some days it overwhelms me to the point loud, harsh words come out of my mouth aimed at those I love most. So, what’s a girl (woman) to do? I find I have to still my mind and delve back into God’s word, studying His prescription for Biblical Womanhood. I fell in love with the Proverbs 31 woman towards the end of high school. I have made it a point every year since, to read through those scriptures at least once per year and to read one biblically based book built around the Proverbs 31 scripture. I have journals full of notes, insights and directives. The reality is God gave us a blue print. Like many things He calls us to, it is unattainable in our humanness. It is perfection. It is the bar by which we can assess ourselves. It is the end mark to strive for. In more recent years I have begun to study more in depth the women of scripture. So often we glean the story for a main idea or truth and move on. We know the story from first glance. But, if we delve into each story, dig deep, we find that every woman in scripture is an example, a living out of the Proverbs 31 woman. When we step back and let God unfold before our eyes the big picture, what I like to call His tapestry, we see that we are called to be the &. Recently in scripture God used the stories (yes, there is more than one) of the beloved sisters, Mary & Martha, to teach me much about Biblical Womanhood and the &. In the faith walk, I have found that little is about doing this or that. Instead, I find He calls me to keep adding to. Not adding to my schedule, but adding to my skills, my knowledge, my character, my faith. He calls me to the &. I am not to be more Mary, I am to be Mary & Martha. He didn’t chastise Martha for her planning, preparations and provisions. He chastised her for not knowing when to stop and enjoy the fellowship. God used this story and others to show me my life story is about all the &. All my experiences are a part of who I am. Each one plays a role in my story, in who I am becoming, in my faith walk. I so often want to move past the mistakes, the failures, the broken heart and think only on the good, share only the mountain top experiences. When I do that I rob others of my testimony. God’s handiwork is not evidenced. I rob myself of the confidence and joy that comes from growing, making it through, moving forward. I am the good & the bad. I am the joyful moments & the heart wrenched moments. I am the insecure wife & the wife growing in confidence. Less than 30 days ago, after having a real aha moment regarding brokenness and pouring myself out in order to really be a testament, a business opportunity came across my path. the company is called Mary & Martha. As I read more about the opportunity I read where the & is key to the company’s philosophy and mission. 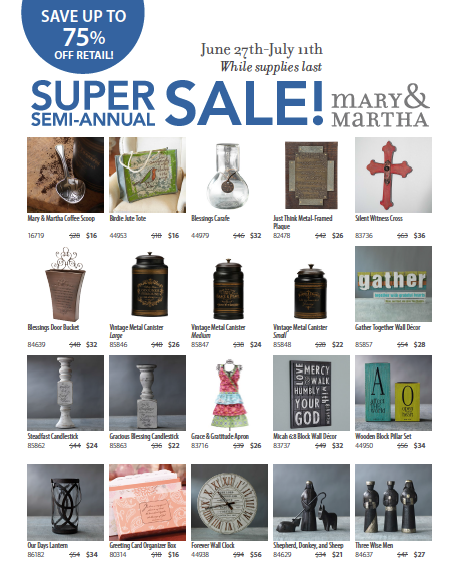 The company is a direct sales company selling home decor products with a faith message. The purpose is to use the business to engage with women helping them learn to entertain (entertaining made simple) and use their homes to minister to others. I LOVE it! I love the message of the company more than I love the products, but let me tell you, the products are incredible. They are above and beyond what one would think they would be. They are quality. They are built to last. It’s been a journey the past few years. One I wouldn’t trade. I am learning to live the & and I am going to treasure it all.